Thomas Malthus scholar, clergyman, philosopher, writer and political theorist was one of the most influential thinkers of the 19th century. He made important and significant contributions to economic, political, social and scientific thought. He is even credited with introducing the theory of natural selection, which was to be adopted by Darwin. 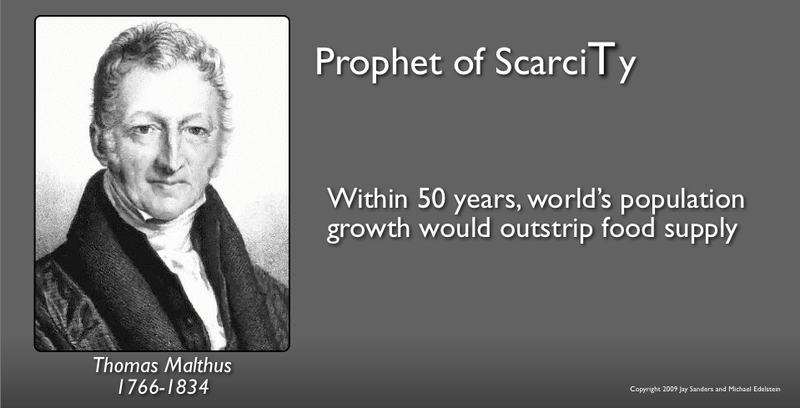 He’s most famous, however, for this prediction he made in the early 1800s when he said that ‘within 50 years the world’s population would outstrip the food supply’. It’s now 211 years later and the planet is supporting an additional 6 billion people. Given his prodigious sagacity how could he have been so wrong? I would argue that his machinations didn’t take into account the dynamic creative potential of freedom. During the 700 years, from 1100 – 1800, Europe progressed from the slavery of feudalism to a freedom based on the rights to property and an equality of position. In and around 1800 those forces reached a tipping point from which there could be no return to the ancien regime. Millions of Europeans became sufficiently free and democratic enough to put their collective intellects towards the betterment of themselves and in so doing the entire human condition. ‘Whilst the kings were ruining themselves by their great enterprises, and the nobles exhausting their resources by private wars, the lower classes were enriching themselves in commerce. The influence of money began to be perceptible in state affairs. ‘As soon as land was held on any other than a feudal tenure, and personal property began in its turn to confer influence and power, every improvement which was introduced in commerce or manufacture was a fresh element of the equality of conditions. John Stuart Mill chronicles the English progression. ‘Of old, every proprietor of land was sovereign over its inhabitants, while the cultivators could not even call their bodily powers their own. It was by degrees only, and in a succession of ages, that their personal emancipation was effected, and their labour became theirs to sell for whatever they could obtain for it. They became the rich men’s equals in the eye of the law…………. ‘The poor could now acquire property; the path was open to them to quit their own class……..their rise became a common occurrence. ‘Today knowledge and intelligence are spreading, in a degree which was formerly thought impossible, to the lower, and down even to the lowest rank………..
‘any knowledge which gives the habit of forming an opinion, and the capacity of expressing that opinion, constitutes political power; and if combined with the capacity and habit of acting in concert, a formidable one. ‘It is in this last element, the power of combined action, that the progress of the Democracy has been most gigantic. Today many movements and causes espouse Malthusian ideas backed up by impressive scientific data. They argue that once again we are facing certain destruction. So the obvious question is, will current science have the solutions? Perhaps there will be another democratic creative burst similar to the one described by de Tocqueville and Mill. After all there is still much freedom to be earned by millions if not billions, witness Egypt and its surrounds. Gallery | This entry was posted in More about Creativity, The American Economic Psyche and tagged Creativity, De Tocqueville, Egypt, Financial Literacy, Financial Planning, Freedom, John Stuart Mill, Personal Finance, Personal Financial Planning, Retirement Planning. Bookmark the permalink.